Curly-Coated Retrievers: What's Good About 'Em? What's Bad About 'Em? 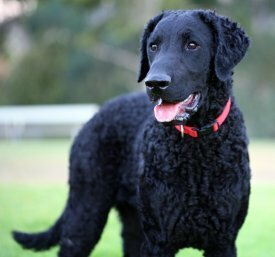 Curly Coated Retrievers: the most honest dog breed review you'll ever find about Curly Coated Retriever temperament, personality, and behavior. This strong and robust dog is also elegant and graceful, quick and agile. His daily exercise requirement is such that he belongs with an athletic owner who will take him jogging, biking, hiking, and swimming. Though reserved and sometimes distrustful with strangers, he should remain poised and hold his ground. A Curly Coated Retriever puppy needs more socialization than other retrievers to develop a confident temperament. Many have sensible protective instincts and may not welcome strangers into their homes as will a Golden or Labrador Retriever. He relates well to other animals and is playful and accepting. Described as "wickedly smart," he may use his intelligence in clever, independent ways that suit his own purposes. Thus he needs early obedience training to establish that you are in charge. All retrievers are slow to mature, and the Curly-Coat remains playfully puppyish for many years. This sounds delightful, but does require patience and control to live with. A Curly-Coated Retriever may be right for you. A Curly-Coated Retriever may not be right for you. You can avoid some negative traits by choosing an ADULT dog from an animal shelter or rescue group. With an adult dog, you can easily see what you're getting, and plenty of adult Curlies have already proven themselves not to have negative characteristics. Finally, you can avoid some negative traits by training your Curly-Coated Retriever to respect you and by following the 11-step care program in my book, 11 Things You Must Do Right To Keep Your Dog Healthy and Happy. Providing enough exercise and mental stimulation. Compared to the more familiar Labrador and Golden Retrievers, Curly Coated Retrievers are more active and more athletic. Curlies need more exercise – more opportunities to vent their energy and do interesting things. Otherwise they will become bored, which they usually express by barking and destructive chewing. Providing enough socialization. Standoffish by nature, Curly-Coated Retrievers need extensive exposure to people and to unusual sights and sounds. Otherwise their natural caution can become suspiciousness or shyness, which are difficult to live with. Stubbornness. Again, compared to Labs and Goldens, Curlycoated Retrievers are more stubborn and can be manipulative. Yet they are smart dogs who are willing to learn if you show them, through absolute consistency, that you mean what you say. To teach your Curly to listen to you, "Respect Training" is mandatory. See Training Curly Coated Retrievers. Shedding and trimming. Curly Coated Retrievers do shed, so don't let anyone tell you that they're "light shedding" or hypoallergenic. They're not. Curlies also need occasional trimming to keep their curly locks from becoming too long and shaggy. Finding one. Curlies are not a common breed, so you'll need to search hard for a breeder, get on their waiting list, and pay a steep price. Potential health problems. All retriever breeds are susceptible to crippling joint and bone problems, and inherited eye diseases that can lead to blindness. In addition, epilepsy and heart disease are serious concerns in the Curly-Coated Retriever.